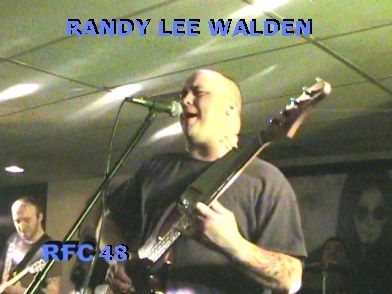 Radio Free Charleston 48 is the first of our tribute shows to the late Randy Lee Walden, the lead singer and bass player for Quick And Dirty, who appeared on RFC 44 back in June. Randy was found dead in Quick And Dirty’s rehearsal space before a scheduled show by the band on June 30. It was an apparent cardiac arrest. Randy was only 30. 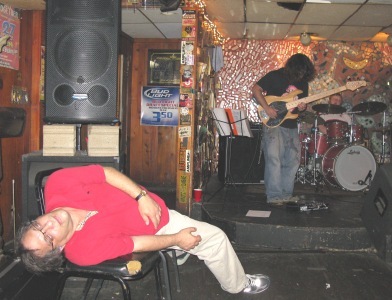 For this tribute show, we focus on Randy’s most recent band, Quick And Dirty. We were lucky enough to have recorded them last May, the first night that they played a proper show. At that point they’d only been together for three weeks, and they already had enough original material for a killer set, opening for Dog Soldier. We plan to do a more elaborate tribute to Randy in a couple of months, but in the spirit of “Quick And Dirty” I wanted to get this online as soon as possible. I picked up a new microphone for the White Room Studio here at stately Radio Free Charleston Manor (Not to be confused with The PopCult Mansion. That’s the one with the Grotto. ), and being a pround new owner, I took a photo of it, which screamed to be digitally-assaulted. So here’s the digitally-assaulted photograph of the Shure 55SH Series II microphone that I picked up at Cheapbeats in South Charleston. Cool, huh? I have been slacking off big-time this summer when it comes to my Cafepress stores. However, you are now able to cruise over to the Monday Morning Art Cafepress store and purchase this image on a variety of garments and fine trinketry. I’m also offering the images from the last three weeks of Monday Morning Art in the store, as well. All of the artwork that I created for Emily haynes last Spring will be available from the PopCult Cafepress store at least through the end of summer. All proceeds will go to Emily, as will proceeds from the Monday Morning Art store. And as always, click the image for a larger version. After the jump, we have loads more Kate goodness…. 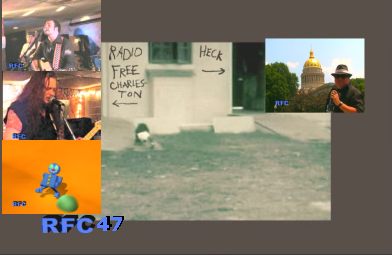 The latest episode of Radio Free Charleston, “Ted Petty Shirt” is online now! 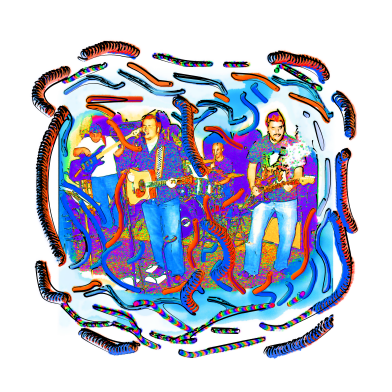 This edition brings you music from The Diablo Blues Band and Mark Bates and The Vacancies. We also have a taste of next week’s tribute to Quick And Dirty’s late lead singer, Randy Lee Walden, animation from Frank Panucci, and a look at what’s going on at The Blue Parrot this weekend. This is another music-packed show, shot on location at The Empty Glass and The Blue Parrot, two of the best rock n’ roll bars in Charleston. A trivia note for those of you following on your scorecards at home: Both performances on this show were shot on July 11, shortly after we shot the host segments at The Hansford Art House for our previous episode! That was a busy and productive night for the RFC crew. So Little Time, So Much To Do: The PopCult MEGA-WEEKEND!! Punk Jazz bassist Eli Namay literally knocked out the audience with his virtuosity at the Empty Glass last night. There are so many cool things happening this weekend that we had to start early. Last night at the Sound Factory, people came out to pay tribute to the late Derick Kirk, with music from Comparsa, The VooDoo Katz, Ryan Kennedy and others. Across town at The Empty Glass, your loyal PopCulter and his Diva, Melanie, were in attendance at the final performance by Chuck Biel’s Punk Jazz, which is disbanding on the exit of virtuoso bassist Eli Namay, who’s winging off to Musical Super-Hero Academy in the fall. It was an evening of incredible music, the likes of which we simply do not get enough of here in town. Chuck Biel was tearing off progressive riffs like a madman while Eli was channeling Jaco Pastorius and Casi Null filled the air with inventive chords. Drummer Jimmy Holly kept the beat even though he was dealing with time signatures that looked like algebraic equations. Chuck will be taking a year off from performing following his final gig with the Underdog Blues Revue next Saturday, and it’s going to be a long wait to see what he cooks up in his musical lab during his time away from prying public ears. And that was just Thursday! Full details on the rest of this busy weekend follow after the jump. 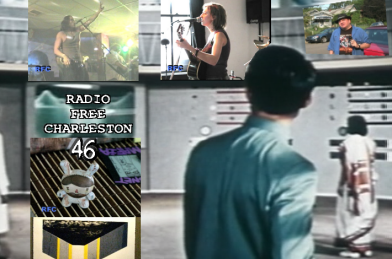 The 46th episode of Radio Free Charleston is online now! Rush on over to watch it. This installment features full songs from Casi Null (singing about the infamous Blue Haze) and Dog Soldier (singing about the infamous Christmas). We also have parts of songs from future RFC guests The Buttonflies (in the 120 Second Art Show) and The Diablo Blues Band (over the end credits). Our Monday Morning Art this week is a digital painting of Casi Null, who coincidentally is one of the guests on Radio Free Charleston 46, which you ought to be able to watch tomorrow. In fact, that’s when I’ll have time to update the Monday Morning Art store, too, so get off my back about slacking off and not updating it for a month already. And watch the show. It features Casi with her song “Blue Haze,” Dog Soldier and snippets of songs from The Buttonflies and The Diablo Blues Band. Be sure to catch it. It’s a good ‘un.